Thuraya satellite telephone dual mode (GSM and satellite) handsets integrate terrestrial and satellite services, expanding the boundaries of local telecom providers and allowing customers to roam vast areas without service interruption or failure. Thuraya mobile services are ideal for telephony services in underserved areas mainly in the following segments: individuals in need of reliable satellite communication, frequent Travellers, Oil and Gas, Construction, Tourism, Media, Agriculture, Forestry, Governments, UN and NGOs. The ‘Roaming’ service in Thuraya makes it possible for GSM subscribers to have access to the latest mobile satellite technology by using the Thuraya handset. These users can access Thuraya network in Thuraya coverage area in and out of their home countries and wherever GSM coverage lapses. On the other hand, Thuraya subscribers can roam within any Live Roaming Partner GSM Network according to their preference or when they are out of Thuraya satellite coverage reach. Thuraya handheld phones are ably supported with Indoor Enablers and Accessories. With Thuraya’s Fixed Docking Unit (FDU), satellite telephony is no more a communication tool of the outdoors. Thuraya’s FDU is a home/office-docking adaptor that allows the usage of the Thuraya satellite mobile phone in an indoor environment. In addition, the Vehicular Docking Adapter (VDA) provides a station for the Thuraya phone recharging and in-vehicle operations. The VDA complements the Thuraya phone by extending its operations and functionalities in mobile dynamic environments whether at road or at sea. Both FDU and the VDA are compatible for usage with ThurayaMarine as well. As the world’s smartest and lightest dual-mode satellite mobile phone (170g), Thuraya SG-2520 offers dynamic performance, inimitable style and innovative features surpassing all other available satellite-based products. Using cutting edge satellite technology, Thuraya SG-2520 is an advanced "smart phone" with 3-in-1 integrated technologies (satellite, GSM Tri-band and GPS) offering users an unparalleled combination of quality and performance. The satellite service option in Thuraya SG-2520 allows you to roam across nearly one third of the globe, from border to border; in urban areas and remote locations providing the advantages of easy mobility and seamless service beyond land-based telecommunication systems. 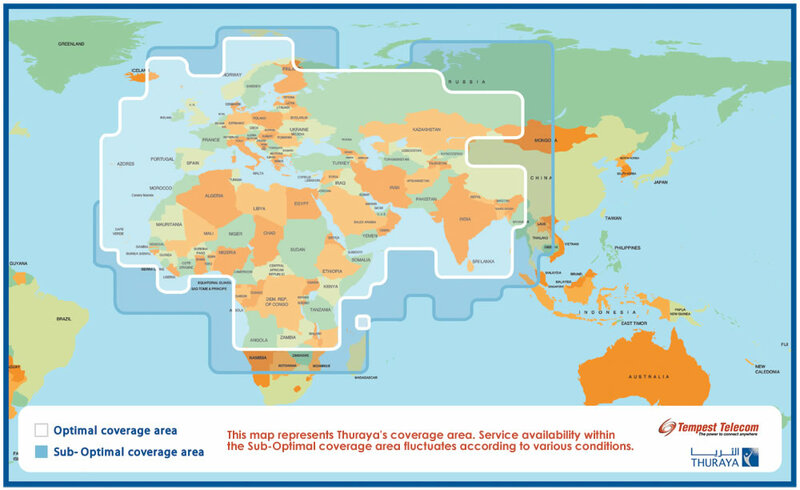 This means that if you are in Thuraya’s coverage area you can make and receive calls anywhere in the world. And when outside the coverage area, you can also use your phone within a GSM compatible network. Thuraya SG-2520 offers superior GPS navigation capabilities that allow users to find locations and reach destinations quickly and safely. Thuraya SO-2510 offers satellite services exclusively in a mobile handset that is as compact and light as a small GSM phone. As the world’s smallest and lightest satellite phone ever made (weighing only 130 g and measuring 118 x 53 x 18.8 mm), Thuraya SO-2510 has redefined the perception of a satellite mobile phone. The Thuraya SO-2510 is sleek and stylishly designed in appearance - far from the traditionally bulky satellite phones to satisfy the present-day users’ demands in taste and convenience. In addition, the small satellite phone is built to sustain the harshest of environment and rugged usage. Catering to diverse customer segments across the world - from a travelling businessman to a reporter to a oil-rig worker, the portable phone is highly user friendly, offers high quality performance and features simple navigation capabilities. Small in Size. Large in Features. Smaller in size, the Thuraya SO-2510 is large and rich on features. The phone features include GmPRS, Location Tracking (GPS), Fax and Data at 9.6kbps and SMS - services that allow subscribers to be in touch with the word anytime and anywhere in Thuraya’s coverage area. There are 2 different options for purchasing Thuraya Satellite Telephone airtime; postpaid and prepaid. Postpaid will give you the most flexible option for longterm usage. Prepaid is designed for travelers on short term trips or those wishing to control their budget. Our Thuraya Postpaid SIM cards can be purchased to activate your Thuraya Phone for satellite usage anywhere in the Thuraya coverage area. GSM usage on the Dual Mode SO-2510 requires a valid GSM SIM Card from a wireless provider. To determine your airtime costs, please refer to the above chart. Determine the Zone you are calling from. Then take a look at the Zone you are calling to. This will show you the cost of the call billed per minute. Thuraya Prepaid Super SIM gives you an easy way to control and budget costs for short trips or light usage. Each Prepaid Super SIM gives you 100 Free SMS Messages, 30 Minutes of Free Internet Access, with no monthly or activation fee. Activation fee of $135 and an annual renewal fee is only $60.